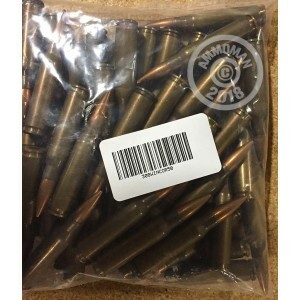 If you want to save big on your shooting costs and don't mind putting a little elbow grease into the cleaning process after a range trip, grab a few of these 50 round bags of .308 Winchester ammunition. These rounds are typically surplus ammunition that uses brass cases and corrosive Berdan primers. As a result, the projectiles will usually be of the full metal jacket type. Corrosive ammunition is safe to shoot and will not damage your firearm provided you clean it thoroughly after every use. Shop at AmmoMan.com to get free shipping on all orders over $99--it's an easy way to save.